Free range chickens… or not? It occurred to me the other day that I had no clear understanding of the term “free range” or even if there was a commonly agreed and legally binding definition. Although we do occasionally have a few more eggs than we can easily use at the moment, we definitely aren’t at a stage yet where we have eggs to sell. However this could happen in the near future so I thought I ought to find out whether “free range” can sensibly be used to describe our poultry system and the egg production. As with most things these days, you can always start by checking on Wikipedia which has a definition for free range. At first glance this seems to be quite authoritative but in reality is just a dictionary definition of the term rather than an explanation of the requirements. Reading further through this article soon becomes confusing as it deals with different international terminology and varying requirements for free range in different jurisdictions. Luckily for UK poultry keepers, DEFRA has a handy booklet on the subject with the snappy title of The welfare of hens in free range systems but as with many government websites there seems to be many different places to get information rather than a single point with ALL the information you would need. If you do not keep your flock in a building (and let them range), you should make sure, where necessary and possible, that birds have protection from adverse weather conditions, predators and risks to their health. They should also have access to a well-drained lying area all the time. Your flock must have continuous daytime access to open runs, mainly covered with vegetation, which have a maximum stocking density of 2,500 birds per hectare. Birds should be encouraged to use the outdoor area by the provision of adequate, suitable, properly managed vegetation, outdoor scratch whole grain feeding, a fresh water supply and overhead cover, all sufficiently far from the house to encourage birds to range. This is all very well but it seems to be mostly aimed at the larger poultry farming operations and is still not a particularly concise definition for an amateur poultry keeper like me. I can barely comprehend the idea of having 2,500 birds on any amount of land never mind that number per hectare! I had somehow expected to find that all animals have some sort of clear understanding for what I had always considered to be a generic term that implied good treatment for the animal concerned. That seems to be about the most concise and readable definition of free range that I have found so far. 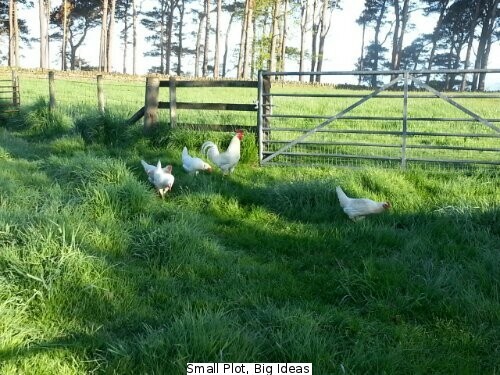 At least it’s reassuring to work out that our relatively small flock of 13 laying hens and a rooster can quite definitely be termed “free range”. If you know of a more concise or clearer practical definition for “free range” as it relates to poultry then please let me know via the comments below.